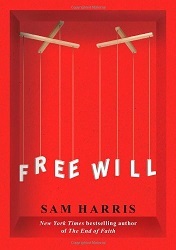 I am currently researching an epic pair of posts re-examining Sam Harris’ debate on morality against William Lane Craig from April 2011 at The University of Notre Dame and in particular Craig’s wilful misrepresentation of Harris’ written work. This has necessitated me engaging in the mammoth – albeit wonderfully rewarding – re-reading Harris’ books, The End of Faith, Letter to a Christian Nation, The Moral Landscape and Free Will. I have always loathed the faithful’s concept of “free will” but have never had the means to tackle it head-on. I invariably put the term in scare quotes to signify my distain. It is part of the disgusting branch of theological “thought” called “theodicy”, aka making excuses for your imaginary best friend’s failure to do anything about all the evil and suffering in the World. Theists argue that God have given us “free will” to act how we please and to believe in him or not and our rejection of him. However, poor old God’s heart is broken when we abuse our “free will” to reject his boundless love and commit atrocities against our fellow man. For me, this concept is philosophically and semantically incoherent to the point that I had no idea how to mount an argument against it. How can you have a choice not to believe in God? Taking the coward’s way out with Pascal’s Wager is at best feigning a belief in God. There are plenty of facts about the World that I do not especially like – such as the existence of famine, genocide and the wonderfully designed AIDS virus – but have to accept because there is plenty of evidence for their existence regardless of whether or not I find them comforting. If presented with sufficient evidence for God’s existence – such as a big face and a booming voice sticking out of the clouds striking sinners down with fire and brimstone rather like the God of the Bible I was made to learn about in school – I would believe. You are not free to choose options of which you are not aware. For example, if someone asks you to think of a film, you would not be able to choose The Maltese Falcon if you have never heard of it. Modern neuro-imagining shows that our brains have formed our decisions seconds, sometimes minutes, before we are aware of them. All of our thoughts and actions are governed by a string of prior causes over which we have no control: genes, upbringing and environment. Even people who believe in “free will” accept that certain medical conditions will affect a person’s thoughts and actions such as depression, diabetes and brain tumours. Therefore, you have as much “free will” to be a homosexual as you have to be black or white skinned. Compromise positions on “free will” such as “compatibilism” that concede that our thoughts and actions are influenced by prior causes over which we have no control amount to saying “a puppet has free will as long as it loves its strings”. As counter-intuitive as it seems, it makes no more sense than to hate a psychopath who has tried to cut you up with an axe than to hate a grizzly bear who has tried to eat you. Retribution and personal hatred of people makes no sense as we are punishing people for acts for which ultimately they are not responsible. Our criminal justice should be geared towards protection of the public at large (which does include incarceration) and rehabilitation but not retribution and revenge. If we developed a pill that could cure psychopathy with no side effects, it would make no sense to withhold it from a violent psychopath as a punishment for what they have done. Swallowing determinism whole by “throwing the oars out of the boat” and doing nothing but drift through life and seeing what happens is a course of action over which we have no control and is therefore impossible. Just try staying in bed and waiting for something to happen: very soon you will feel the urge to get out bed and do something, like eating or going to the loo! In my view, the reality of good and evil does not depend upon the existence of free will, because with or without free will, we can distinguish between suffering and happiness. With or without free will, a psychopath who enjoys killing children is different from a paediatric surgeon who enjoys saving them. Whatever the truth about free will, these distinctions are unmistakable and well worth caring about. Might free will somehow be required for goodness to be manifest? How, for instance, does one become a paediatric surgeon? Well, you must first be born, with an intact nervous system, and then provided with a proper education. No freedom there, I’m afraid. You must also have the physical talent for the job and avoid smashing your hands at rugby. Needless to say, it won’t do to be someone who faints at the sight of blood. Chalk these achievements up to good luck as well. At some point you must decide to become a surgeon—a result, presumably, of first wanting to become one. Will you be the conscious source of this wanting? Will you be responsible for its prevailing over all the other things you want but that are incompatible with a career in medicine? No. If you succeed at becoming a surgeon, you will simply find yourself standing one day, scalpel in hand, at the confluence of all the genetic and environmental causes that led you to develop along this line. None of these events requires that you, the conscious subject, be the ultimate cause of your aspirations, abilities, and resulting behaviour. And, needless to say, you can take no credit for the fact that you weren’t born a psychopath. Of course, I’m not saying that you can become a surgeon by accident—you must do many things, deliberately and well, and in the appropriate sequence, year after year. Becoming a surgeon requires effort. But can you take credit for your disposition to make that effort? To turn the matter around, am I responsible for the fact that it has never once occurred to me that I might like to be a surgeon? Who gets the blame for my lack of inspiration? And what if the desire to become a surgeon suddenly arises tomorrow and becomes so intense that I jettison my other professional goals and enrol in medical school? Would I—that is, the part of me that is actually experiencing my life—be the true cause of these developments? Every moment of conscious effort—every thought, intention, and decision—will have been caused by events of which I am not conscious. Where is the freedom in this? What many people seem to be missing is the positive side of these truths. Seeing through the illusion of free will does not undercut the reality of love, for example—because loving other people is not a matter of fixating on the underlying causes of their behaviour. Rather, it is a matter of caring about them as people and enjoying their company. We want those we love to be happy, and we want to feel the way we feel in their presence. The difference between happiness and suffering does not depend on free will—indeed, it has no logical relationship to it (but then, nothing does, because the very idea of free will makes no sense). In loving others, and in seeking happiness ourselves, we are primarily concerned with the character of conscious experience. Fans of Dan’s account—and there are many—seem to miss my primary purpose in writing about free will. My goal is to show how the traditional notion is flawed, and to point out the consequences of our being taken in by it. Whenever Dan discusses free will, he bypasses the traditional idea and offers a revised version that he believes to be the only one “worth wanting.” Dan insists that this conceptual refinement is a great strength of his approach, analogous to other manoeuvres in science and philosophy that allow us to get past how things seem so that we can discover how they actually are. I do not agree. From my point of view, he has simply changed the subject in a way that either confuses people or lets them off the hook too easily.